Ile Ife, also known as Ife, is an ancient Yoruba city in the southwestern part of Nigeria. Ile Ife is said to be dated back around 500 B.C. when it was founded and is the oldest Yoruba city. 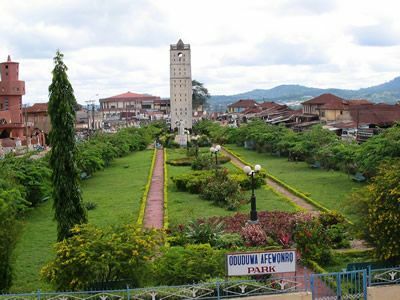 It is presently part of Osun State and has an estimated population of 501,000 people. Ife is home to one of Nigeria’s most prestigious universities, Obafemi Awolowo University, as well as the Natural History Museum of Nigeria. Ife is also a prominent regional agricultural center for a surrounding area that produces vegetables, grain cacao, tobacco, and cotton. Ile Ife is the city where the Yoruba believe their civilization began as well as the location where the gods descended to earth. The name, Ile Ife, literally means place of dispersion. According to Yoruba tradition, Ife was founded by the deities Oduduwa and Obatala when they created the world. Obatala fashioned the first humans out of clay while Oduduwa became the first divine king of the Yoruba people. Historical evidence, however, tells a different story. According to historians the area was originally populated by the Igbo people when Oduduwa and his army invaded the city from the north, pushed the earlier inhabitants to the east, and established the first Yoruba kingdom. After the death of Oduduwa, his sons and other descendants spread out from Ile Ife to found other Yoruba states. Eventually the Yoruba became one of Africa‘s largest ethnic groups. They also remain the vast majority of Ife’s inhabitants. The current royal dynasty of Ile Ife is over eight centuries old. Alayeluwa Oba Okunade Sijuwade Olubuse II, the current ruler, became Oba (King) in 1980. Ife is world famous for its art. Between 700 and 900 A.D. the city began to develop as a major artistic center. By the 12th Century Ife artists were creating bronze, stone, and terracotta sculptures, some of which are found today in museums in Nigeria, Europe, and North America. The artistic production of Ife began to wane in the 1500s as political power and wealth shifted to neighboring kingdoms such as Benin and Oyo. Obafemi Awolowo University (OAU), one of the leading academic institutions in West Africa, is the major institution of higher learning in the city. Founded in 1962 as the University of Ife, it was rechristened by the Federal Military Government of Nigeria as the Obafemi Awolowo University on May 12, 1987, in honor of one of its most distinguished founding fathers, eminent nationalist and former chancellor, Chief Jeremiah Obafemi Awolowo (1909–1987). I.A. Akinjogbin, The Cradle of a Race: Ife from the Beginning to 1980 (Port Harcourt [Nigeria]:Sunray Publishers, 1992); William Bascom, The Yoruba of Southwestern Nigeria (New York: Holt, Rinehart and Winston, 1969); Frank Willett, Ife in the History of West African Sculpture (New York: McGraw-Hill, 1967); http://www.oauife.edu.ng/; http://www.historywiz.org/ife.htm; BBC: Ife and Benin; http://www.bbc.co.uk/worldservice/africa/features/storyofafrica/4chapter7.shtml.